A new Quality Tourism Concept « Nativewalks. Barcelona walking tours. Our goal? To show you my Barcelona, away from the crowds and knowing the people and culture of the place. Feel the experience to be a part of this wonderful city. Let me show you the peaceful corners, our ancient cellars ( a.k.a Bodegas ), the original tapas bars, the other neighborhoods in the city… Participates in the daily life of Barcelona and our traditions. If you are an adventurous and curious person, we are the best choice. Have you ever been to Barcelona? 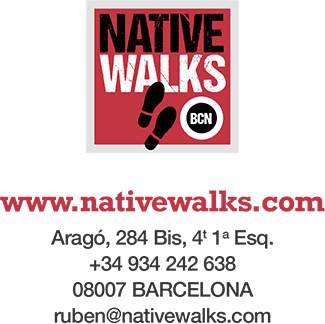 If you haven’t been with NATIVE WALKS BCN, you don’t know the real Barcelona. We offer quality and custom tours, fully adjustable to the needs and interests of each customer, without falling into the standardization that leads to monotony offering exclusivity and innovation, and a very professional presale service. We stand for: Credibility, commitment and responsibility, mixed with versatility, flexibility and originality. We’re close and we are friendly, so it’s easy to contact us using the web, e-mail or directly by phone. The important is that we can talk about your likes, expectations and tell us what you really want to know about the city and their surroundings. Sure that we will give you everything you expect from this city. And more. Ah! And don’t forget to mention if you have known us by a friend or relative who recommended you contact us. We like that and helps us know if we’re doing right.